Every time I go to Japan I pass through, what to me is one of the most beautiful buildings in the world, Kansai International Airport in Osaka, Japan. During the late 1960s the Osaka Prefecture government had a little problem with their present airport as it was nearing full capacity and the expansion of the present airport was a physical impossibility. This was due to the present airport being totally land locked. Also the people of Osaka didnt want the airport within the city to be any bigger fearing noise pollution or the potential of a large disaster befalling the city. So, in the late 1960s the Japanese Government began looking for suitable places to build a replacement airport where the environmental issues of the people of Osaka and the political needs of the area would be addressed. So began one of the largest and strangest civil engineering projects to take place in Japan. The location finally chosen for the new airport was an area just of the coast in the Osaka Bay Area in the sea. The sea in the Osaka Bay area is about 60 metres deep and this had to be brought to above sea level before the construction of the airport could even begin. 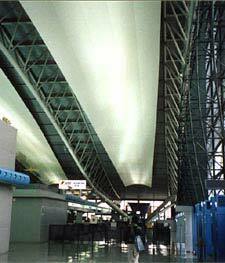 The airport is basically built on recycled land within the sea, in Osaka Bay. The island construction was started in 1987 this began with the construction of the sea wall. The area the airport had to occupy was first laid out as a large rectangular box in the sea before it could be filled in. This was done by firstly hammering several thousand foundation piles driven into the sea bed as a foundation for the airport island to sit on top of and hopefully spread its massive load and prevent the island sinking in to the sea. The next step is to build a very large rectangular box in the sea. This was done by dumping millions of tons of huge rocks into the sea to form a huge box. The final rectangular box ended up 2-1/2 miles by 4000 feet wide and 5 metres high. To fill this required over 750 million cubic feet of earth. This had a secondary effect that the land used to fill the island was a mountain on the mainland. This is now a new area where much-needed houses and commercial property has be built. Once the island was finished the building of the airport and runway could be completed and this is the part of Kansai Airport which will amaze most visitors. Coming into land you will be shocked as it looks like the plane is going to land on the water right up to the last moment as land appears and the plane touches the runway. 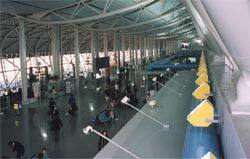 Arriving at Kansai international Airport you will have to go through customs. This involves filling in a temporary visa, much the same as some of you might have filled in for other destinations. This should be handed to the customs clerk with your passport when requested. Just a word of note: You will have to queue to see the customs clerk and there is a yellow line, which you must stand behind until beckoned. Failure will result in your line being held up until you return to behind the yellow line. Once inside the main airport building its huge. Some 1.7 kilometres long and being one large room split into several floors. (Apparently this is the largest single roomed building in the world). There is even a railway to take you from one end to the other. The shape of the building itself is amazing, its a bit hard to explain but I´ll have a go. Image a large torus, a shape like a bike tyre or doughnut ring. Then make it 60 km in diameter, then let just 1.7 kilometres stick out of the earth. Thats the shape of the airport building. From the outside the whole building is glass panelled and shines in the sunshine as you approach the airport down the Hanshin Expressway, a 5-kilometre bridge, which links the airport from the mainland. The bridge itself has 2-stories with the railway on the bottom deck and the main highway above. It is quite expensive to use the motorway toll bridge and if your going to the airport its best to use Limousine buses (High quality buses which drive to the centre of the main cities) or use the train which is very quick and fairly cheap. Just a quick note: the express way was made in the UK and then shipped in sections and assembled in Osaka bay. A more scenic way to get to the airport is the Water ferry which goes from several places around the bay, takes less time than the roads, however its very expensive, when I went on it in 1998 it was £78 return each, and it wont have got cheaper. Anyway back to the airport building. The first view you will get when you walk into the airport depends on which floor you enter at. The car parks will bring you in to the airport at the departure entrance and the bus and train stations will bring you to the arrivals entrance. The view as you walk through the door is of a massive space. Even though the airport has only four floors these floors dont meet the outside edge of the building. This gives an spectacular impression of height as the roof is a good 30 feet above the top floor. From the roof are hung huge mobiles, which spin and wave as the air conditioning, which blasts from huge blowers placed on one side of the airport, gets passed around the building. Nearly everything in the airport is white, except for the flooring. On entry there are large signs explaining which colour on the floor leads to which area. For example red is for departures, so if your leaving Japan you find a redline on the floor and follow it. Blue is for arrivals! As I said before Kansai international Airport is one big room it is spilt into different sections which are separated by large glass partitions and from the top floor of the building which is departures. You can see the entire airport interior, the runway and airplane parking. 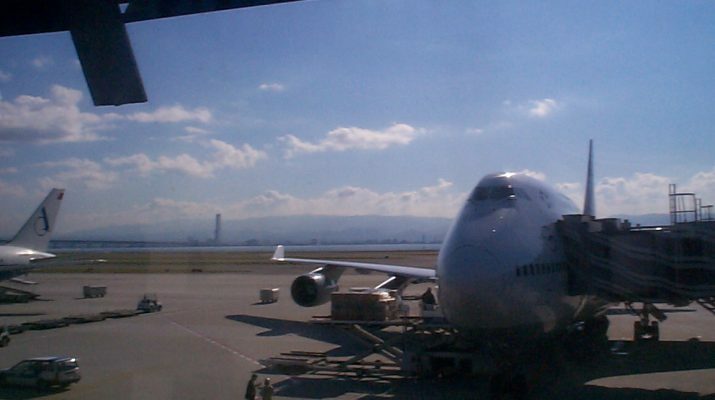 On the other side of the airport is the Aeroplaza hotel with Osaka Bay and Kobe in the distance. As with nearly all airports now, there are several shops with the usual airport gifts and foods, which are reasonably priced for an airport. 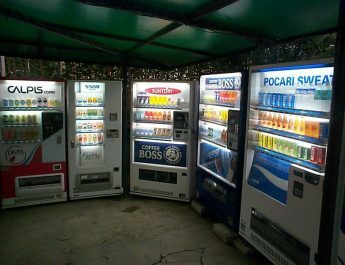 However the duty free shops at Kansai do not offer any kind of variety whatsoever and offer mainly Japanese brand names. Also you cant bring more than 200 Cigarrettes back from Japan, even if you have a stop over in an EU country. If you are just visiting the airport then a trip to the Observation Lounge at the end of the runway is well worth a visit. Situated at the front end of the runway, you get to see planes landing and turning slowly past the lounge as they taxi to the terminal. Also you can see the planes barrelling down the runway as they take off. This is free entry and there is a courtesy bus from the terminal to get you there. One note of interest is that if you are departing from Kansai international Airport you will have to pay a 2600 yen departure tax which is about 13 pounds. This is done by buying a ticket and then using the ticket to open the gate to the Departure lounge. It always amuses me that they have a pretty young lady who collects your ticket and puts it in the exit turnstile for you. What a job! Besides the magnificent building that is the airport terminal, this is an amazing airport. Built out of nothing in the middle of the sea this is one of Japans most amazing technological masterpieces aside the Akashi Kaikyo Bridge. This is the worlds longest suspension bridge which is less than 40 kilometres away. There is however a problem with the airport. It is slowly sinking into the sea. The clay seabed that the island is built on is slowly sinking from the weight of the airport. Since the airport was opened in 1994 it has already sank more than the engineers who built the island predicted. This has left the airport operator with a large problem. As the island sinks the main building must be kept level as too much flexing would cause the structure to fail. The engineers at the terminal have solved this problem by installing an ingenious system of jacks under the pillars, which support the terminal building. When the island moves then the columns, which have moved, are jacked up and large steel plates inserted underneath to keep them level. They have also had to attach all the machinery for the building to the roof of the cellar so that pipes dont crack or staircases break when the island moves. The building however is very tough and has withstood two major natural disasters, the Kobe earthquake in 1995 and the hurricane of 1998 so its not as frail as you might think even though its made from glass! The problems with the first part of Kansai international Airport havent deterred the Japanese from going ahead with planning and building a second runway the same way as the previous island. I look forward to seeing what they have done so far next time I visit.